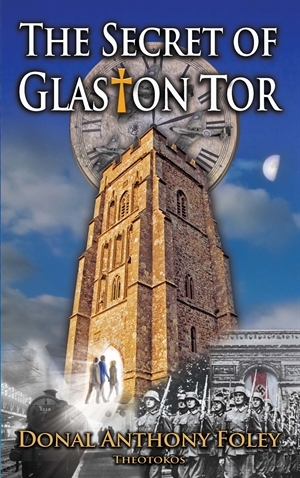 The Secret of Glaston Tor is the first book in a series which will chart the exploits of three cousins, Matt, Luke and Annie, and Annie’s dog, Toby, as they learn the secret of Glastonbury Tor and embark on a series of time-travelling adventures. The Secret of Glaston Tor (ISBN: 978-0957496910) is 8 in. x 5 in. has 238 pages and costs $11.99 / £7.99 / €11.99, plus shipping. The KINDLE version of the book costs $6.00 / £4.52. To order the KINDLE version of the book, please click here … or here…. Fifteen year old Matt Bergin is staying in Glastonbury for Christmas with his cousins, Luke and Annie Martin. Matt feels drawn to Glastonbury Tor, and St Michael’s Tower, which crowns its summit. The cousins learn the secret of Glaston Tor and find themselves propelled back in time to 1940s France and the Second World War. Gradually a group assembles, including some RAF officers whose plane has been shot down, as they stay at an isolated farmhouse. There, they realise that the most obvious way to get out of the country is to go south to the Spanish border, by train, and then to Lisbon. But it’s a very long and dangerous journey, and they would also have to cross the Pyrenees. They make their way to Paris via train, and have various adventures including being interrogated by the Gestapo as suspicious characters. With a compelling plot, captivating characters, suspense, excitement and ever-present danger, The Secret of Glaston Tor will take you on an incredible journey into the past, present, and future – and into the never-ending battle between good and evil . . . This book is particularly meant for 11-14 year olds, but can also be read older young people, or by adults. To order a copy of the book please click here .. The Secret of Glaston Tor is a gripping yarn that has all the ingredients any adventurous reader could desire. Time travel, wartime adventure, interrogation by the secret police, a desperate attempt to escape from France against all the odds. And it’s all woven together with a golden thread of religious truth. Who could ask for more? The Secret of Glaston Tor is a moving story about the power of prayer, love, and goodness, that reaches God’s heart and inspires miracles. It takes us to the heart of the Christian mystery. It is a beautiful story about the pure wish of a child that touches the kind heart of a shopkeeper who makes her dream come true. Donal Foley’s book illuminates the nature of a true wish and gives a glimpse of why these wishes—the deepest desires of the heart—come true. A door opens up to another time and place, and three cousins suddenly find themselves thrust into a daring adventure none of them expected. Saving people in Nazi-occupied France is dangerous enough, but how will they get home? “Compelling read … very good story … good plot … religion dealt with in right way … joy in reading it.” Fr. B. “Gripping stuff for the age group it is directed at, with just the tight approach and tone … particularly liked the time/place atmosphere you managed to create.” L. M.
“It’s certainly very readable, and you have concocted a fascinating plot … The build-up of excitement towards the end was fantastic!” M. B. “I very much enjoyed the novel … I can imagine children finding it very exciting indeed … a good balance of pace, conversation and explanations. I particularly liked the characterisations, and the natural way that you introduce ‘apologetics’.” S. D. L. B.
I read the book and I am over 50. It was an exciting book to say the least.